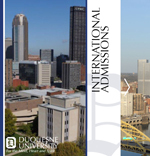 At Duquesne University, we believe it is important to help international students who want to come for their education. Each year, we welcome students from more than 80 countries. As a Duquesne student, you will learn with students from all cultures and backgrounds. Make the Center for Global Engagement your first point of contact. We look forward to serving you as you explore your opportunities at Duquesne. For more videos about being an International Student at Duquesne, visit our Youtube page. A unique undergraduate admission policy that allows students to apply without a TOEFL score. Students are evaluated based on their academic merit, not on their English ability. Located overlooking the ideal study city of Pittsburgh, Pennsylvania. The campus is self-contained and only a five-minute walk from downtown. Dedicated Center for Global Engagement to assist students through the application and new student process. All international students are considered for a merit-based scholarship.